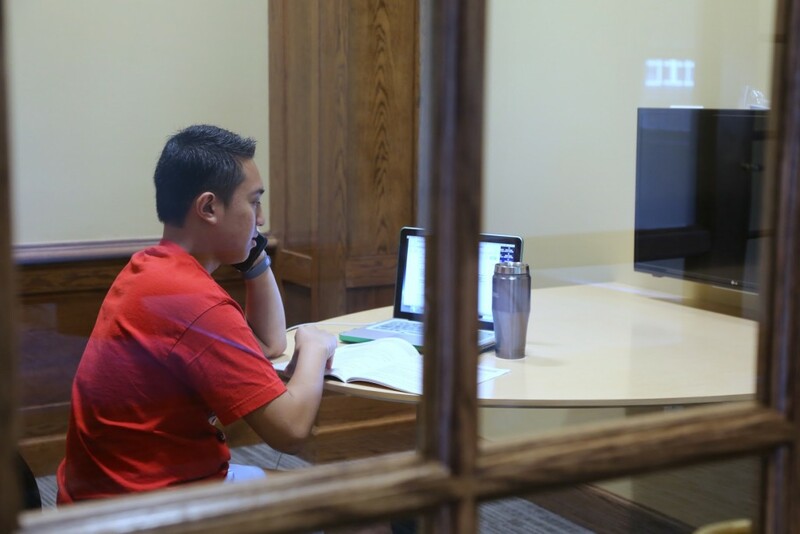 A student uses a private room in the Hubbard Center for an interview. Miranda Dafoe took an internship last year because she was told she would have the opportunity to manage people and expand her skills. The internship was advertised using terms like, "leadership experience,” “no out of pocket expenses” and “resume builder.” She was also told that she would be paid hourly and would get some financial benefits. Dafoe was told that the people she would work with were trained and that she would be paid back for any expenses. Unfortunatey, this was not the case. The workers were not trained and she had to spend money getting supplies for the job. In short, the internship was not at all what it had purported to be. Dafoe had fallen victim to an internship scam. Dafoe, after working for six months, withdrew from the company, and has still not been compensated for her work. Another DePauw student had the same internship. They wished to remain anonymous, but said they chose the company because it would be a good opportunity to be in a leadership position, and would look very good on a resume. They also were told that the opportunity was risk free and there would be no out of pocket expenses. The second student did not leave the company like Dafoe did. When this student found out it was a scam they were too far in debt to stop working completely and at that point the company stopped helping. “It was extremely frustrating because I was left to handle all of the issues and conflicts that came up on my own with little to no guidance from the company” said the student. Despite the efforts of the student trying to protect themselves by keeping detailed records, they still fell victim to this scam. “Even going into it skeptically didn’t allow me to avoid the scam,” said the student. Dafoe stressed the importance of doing your research on a company before you accept an internship offer. “You need to find reviews for your internship. I felt betrayed because I had only looked on the company website and read positive reviews that I now knew were false and failed to mention any of the company’s shortcomings,” said Dafoe. “It’s very important to take in the opinions of those who have came before you,” she said. Aside from reading reviews, there are other red flags that can indicate a scam. Many scams involve “mystery shoppers, pyramid sales schemes and a variety of scams where a student is asked to pay for certification, training materials or equipment – even at times with promise of reimbursement," said Raj Bellani, dean of experiential learning and career planning. These fake internships can be found online and sometimes appear in student emails. The best way to avoid taking these internships is to go and talk to people at the Hubbard Center if you are unsure about a possibility, and if you have a bad feeling about an internship, it might be beneficial to give it a second look.